You move effortlessly together, relaxed and looking fabulous, feeling exquisitely connected, it's magical... the perfect dance! Dancing like this could be easier than you think with the right instruction. It can light up your week, and make you feel great. It can also be one of the most enjoyable parts of preparing for a wedding. Whether you are looking to rid yourself of "two left feet" or want to impress your wedding guests with a glamorous performance, we'll help you hit the dance floor with confidence. You may have heard about us through your wedding planner, as many recommend us to their brides and grooms. 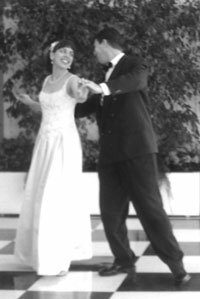 We are North County and San Diego's premier wedding dance specialists and have been featured in San Diego Style Weddings, Brides Magazine and others. We have helped hundreds of San Diego and North County couples learn to dance, many complete beginners, and find it very rewarding: in just a few weeks, avowed non-dancers are gliding across the dance floor! Choose from many exciting styles of ballroom, Latin, and swing dancing, or let us help you pick a dance style to suit your special song. Our studio environment is relaxed and supportive because we know that if your dance lessons are comfortable and fun, it will carry over to "the real world" and help you shine when it counts. In fact, quite a few of our wedding students have told us that their dance lessons were the most fun part of their wedding preparation! Come on in and find out how we can help you have both a wonderful first dance on your wedding day, and an at-the-ready skill to enjoy together always. - - - - - - - Ballroom Dance Lessons... next!